For as wildly anticipated as it is, No Man's Sky is still shrouded in a lot of mystery. We know that it involves a procedurally generated universe and that you and every other player are racing to find the center of it. How do we get there, though? How deep does the universe get? Most importantly, how do I blow stuff up!? Game Informer has all of the new details on Hello Games' highly anticipated indie hit. In this game, you really are just a spec on the surface of the sun. Your character starts off with a 2001: A Space Odyssey-esque psychedelic journey to one of the billions of randomly generated fringe planets, and when you awaken, there will not be another soul around. Maybe you'll have some rare items beside you for early quick cash, or maybe you'll have to start with nothing but the clothes on your back. From there, you'll be forced to find your ship with the help of a mini-map, and catching your ride opens up a map to the entire galaxy. The dangerous journey to the middle of everything will require a constant stream of resources for health benefits, ship-upgrades, and fuel. Money can be snatched up by mining planets for their minerals and blasting down enemy pirate ships. Trade posts found in each system allow you to maintain your ship before moving on. Careful planning from destination to destination is required to make any progress. Stars with different colors provide different elements to mine, and you'll never want to run out of certain minerals. Planets closer towards the center will start to become more dangerous with unpredictable wildlife and robots programmed to defend each planet's natural environment. As for combat, you'll do battle against various ships. Smaller ones are more difficult to hit but easier to destroy thanks to their lack of shields. Larger ones can withstand a huge assault, but they are slower and easier to land massive attacks on. The approach to this combat lies totally in your hands, and death means an escape pod ride to the nearest planet and the loss of all your items and your ship. Dying on the planet surface takes you back to the escape pod and puts you back at square-one in securing a new ride. Best to not get stranded somewhere dangerous. All in all, the main journey to the center is predicted to last about 40 to 100 hours, depending on how thorough your exploration is. Be sure to snag a copy of the latest Game Informer for more details. 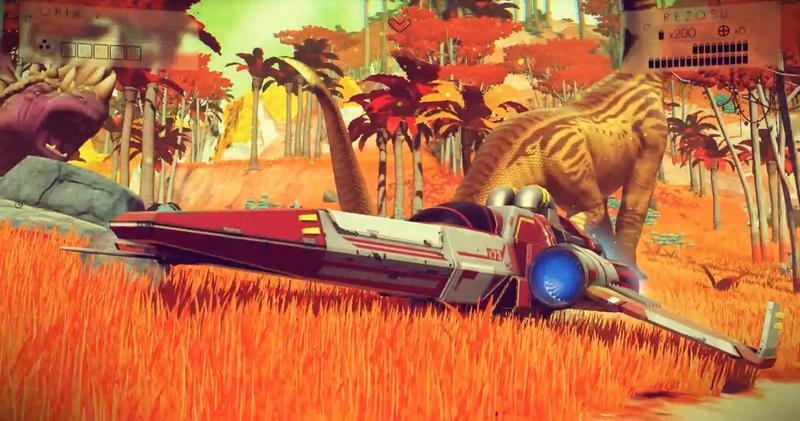 No Man's Sky is coming to the PlayStation 4 and PC sometime in 2015. It's still my most anticipated game of the year, and I really hope it delivers. I need something to boost my confidence in the PlayStation 4 right about now.